Data is critical in today's ag industry and the American Farm Bureau Ag Data Transparent (ADT) certification allows producers to trust that theirs is secure. "The privacy and security principles on which the ADT certification is founded apply to agronomic, land, farm management, machine and weather data," explains Matthew Olson, John Deere product marketing manager for precision ag. "It addresses issues such as data ownership, transparency, consistency, choice, portability, collection, access, data control, disclosure and use, which are important in helping producers make informed decisions about the data partners they work with in their operations." Ag Data Core Principles were developed in 2014 by the American Farm Bureau Federation, along with ag industry leaders including John Deere. The goal of these principles and certification is to help farmers and ranchers understand how their ag data is used when they use products or services. "Producers place a high value on their farm data and the security around it. At John Deere, we are focused on how we can provide them with control, transparency and value connected to that data," Olson continued. "ADT is one tool that aligns with those principles and supports producers’ efforts to make informed decisions around what service providers to use, how they use the data and with whom they share it." 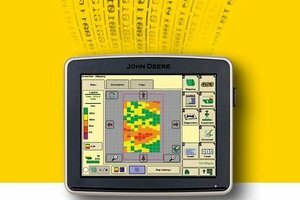 More information on John Deere’s ag data and privacy policies can be found at www.deere.com/trust.